Détente is the easing of strained relations, especially in a political situation, in this case, it is more economical. The "Mother Of All Dinners" or the most important, and much-anticipated dinner date between Trump and Xi in years concluded amid loud applause. The "brief celebrations" by both sides and the idea this has ended the ongoing trade war between America and China with three-month truce is a bit simplistic and rather optimistic. While the US agreed to postpone a planned tariff hike on January first and to keep the rate on existing tariffs at 10% for another 90 days in return for greater purchases of American goods nothing has been resolved. This temporary ceasefire and what Trump declared an “incredible deal” on Air Force One while heading back to the U.S was based on China agreeing to immediately start purchasing "very substantial" U.S. agricultural, energy, industrial and other products from the U.S. to reduce the trade imbalance. Ironically, the deficit has soared in recent months as Chinese exports soared in an effort to front run announced tariffs and at the same time shunned imports from America. This means the trade deficit will only fall slightly but provides relief to both leaders which face slumping stock markets, aside from preserving the status quo on the current state of the trade war it does nothing to change the fundamental divide that exists. Despite the lack of material progress this most likely will help to lessen immediate concerns that escalating trade tensions will create a new Cold War. Still, with less than a month left in the year many traders are taking this as the green-light for a strong Santa Claus Rally, both in the U.S. and China where overnight the China Financial Futures Exchange sent a strong hint to investors to get back in the market by cutting margin requirements for stock index trading. It is on these most thorny of issues that there was no real progress during the Trump-Xi dinner. The reality is that such large and difficult issues seldom if ever turn on a dime but that won't stop politicians from putting lipstick on the pig and parading it out as a real beauty. Wang Yi, China's foreign minister held a briefing in which he said that China and the U.S. had agreed to open markets to each other, with China agreeing to increase U.S. imports as well as addressing its trade imbalance. Wang also said that legitimate U.S. concerns will be resolved as China opens markets and takes additional steps to eliminate all tariffs. Still, the two sides failed to make any tangible progress on the fundamental divide and core issues separating the world’s biggest economies and a sign the meeting was a bust came in the failure to issue a joint statement laying out the framework for a way forward. China sees the trade talks as an American strategy to thwart its rise as a global power. Rather than making a joint statement each side gave its own readout of the outcome. A gap existed between how America and China interpreted what happened at the G20 with China forgetting to mention the 90-day time frame, while the U.S. didn’t reference the One-China policy regarding Taiwan which is another flashpoint between the nations. Peripheral issues that were raised and agreed to include that President Xi is open to approving the Qualcomm-NXP deal if it was presented again putting the mega M&A thing back in play. Also, one of Trump’s goals for Xi dinner was to get China to do more to halt the flow of synthetic opioid fentanyl into the U.S. On this issue Xi agreed to designate fentanyl as a controlled substance meaning people selling fentanyl to the United States will be subject to China’s maximum penalty under the law. The White House also emphasized that Xi agreed to continue pushing for a nuclear-free North Korea. The type of domestic reforms sought by the U.S. are extremely difficult for China in that they reflect upon China's reputation as well as the party’s authority and the very structure of the domestic economy. These concerns with China were laid out in a 53-page report issued by Trade Representative Robert Lighthizer’s office about 10 days before the Trump-Xi meeting. Negotiations have long been stuck over U.S. demands for deep structural reforms such as ending forced technology transfers, enforcing intellectual property rights and ending state subsidies for strategic industries. All these feed into China's “Made in China 2025” policy to lead the world in sectors such as artificial intelligence and robotics. Please note, what we did not see was Xi begging for mercy and begging the U.S. for relief. Buying needed farm goods for a tariff time-out in many ways was a win for China with the immediate beneficiary from the truce being the American farmer, particularly those growing soybeans which Trump needs to win in order to get re-elected in 2020. China has shunned the U.S. bean market leaving farmers with beans coming out of their ears and sagging prices, unfortunately with supplies so large any upturn in price may not be enough to help struggling farmers. Do not be surprised if this turns out to be the first steps in a very long drawn out dance given the risks to the global economy and the political cost talks may drag out until the end of time. 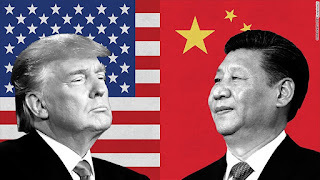 While Xi Jinping hasn’t really defused the Trump bomb it shows that both sides can be pragmatic and he has won another three months before punitive tariffs on $200 billion in goods rise to 25 percent giving Chinese policymakers more time to offset the blow as growth slows. This may mean a burst of buying in the S&P over the next 24 hours pushing the stock index higher, but not much higher as trader concerns should quickly turn back to the Fed which can now revert back to its hawkish bias and resume rising rates well into 2019.